When making props for a theater production or in miniature for a diorama, you may use common substances to create the prop. If you need a cotton candy prop, for example, you don’t want to use real spun sugar because it's sticky and attracts insects when left out. 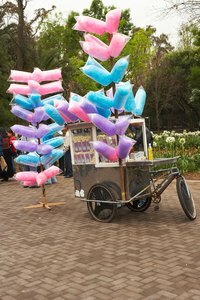 Instead, fabricate a cotton candy facsimile using regular cotton balls dyed to match the color of cotton candy. The fabrication process uses items you may have in your home or school art supply closet. Fill a small bowl half full of tap water. Add a drop of food coloring or watercolor to the water and stir with a bamboo skewer or wooden chopstick. Add more color or dilute until you have the desired color for your cotton candy. Dip a white cotton ball into the colored water and roll it around until the cotton ball is uniformly pink. Remove the cotton ball from the water and squeeze out the excess water, which flattens the cotton ball. Blot the flattened cotton ball with a paper towel to remove most of the water and hang it on a toothpick stuck in foam core to dry. Stretch the dry cotton fibers of each cotton ball in multiple directions to create loosely connected fibers about three to four times the size of the original cotton ball but flattened like a two-dimensional plane. The fibers should resemble a matted spider web. Spray a bamboo skewer or wooden chopstick with spray adhesive. Stick one edge of the stretched cotton to the wood and wrap the cotton loosely around the stick. Lightly spray the fibers with dry adhesive if the cotton candy facsimile is not large enough. Wrap another layer of cotton fiber loosely around the first layer. Continue this process until your cotton candy prop is large enough for your purposes. Spray a light film of hairspray over the cotton layers and hang it upside down to dry.